Anyone can find the high school to college transition tough. Without a family or guardian to help them, young people who grew up in foster care may need extra encouragement from their community. Foster Care to Success sends care packages as one way to show support for foster youth enrolled in college. Each year, Greene County residents generously volunteer their time and talents creating handmade red scarves for those care packages. Would you like to take part in 2018's Red Scarf Project? Keep reading to learn how you can make a scarf and let foster youth know someone is cheering them on. Both knitters and crocheters are welcome, so start by grabbing your favorite needles or hook. You’ll also need red yarn. Whether that means scarlet, burgundy, crimson, red stripes mixed with a second color, or another variation is up to you. 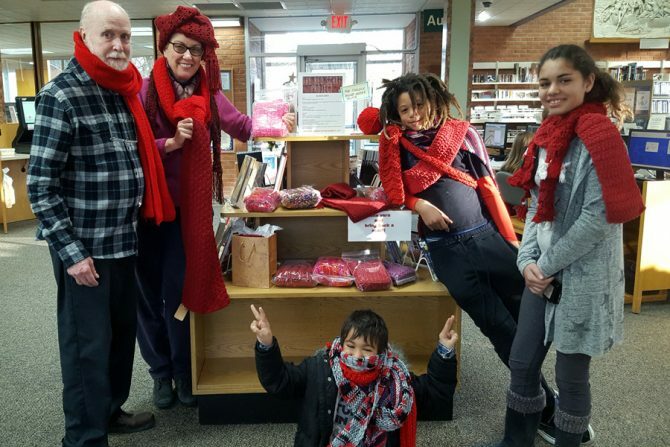 If you don’t have red yarn on hand, stop by Cedarville Community Library or Yellow Springs Community Library to pick some up. Visit the Red Scarf Project Guidelines page to learn the size and style requirements for each scarf. Looking for advice, encouragement, or friendly conversation while you work? Bring your scarf-in-progress to one of our ongoing crafter meetups: Beavercreek’s Calling All Yarn Crafters, Bellbrook’s Tuesday Crochet & Knit Club, or Jamestown’s Crafters Night Out. If you’d like us to send your completed scarf to Foster Care to Success for you, be sure to drop it off at a participating Greene County Public Library location by one of the deadlines listed below.